New products and some special new kits for our international customers! Yo, it's Friday. That means sweet new products! And we've got more new products than you can shake a stick at. Also, check out the video for a full assembly of the new FabFM Kit. You can watch the Vimeo version here. So hopefully that gives you a better idea on what's involved with building the FabFM kit. The thing gets pretty amazing reception, considering we were inside the studio. This area is notorious for bad radio reception, with the mountains and all. 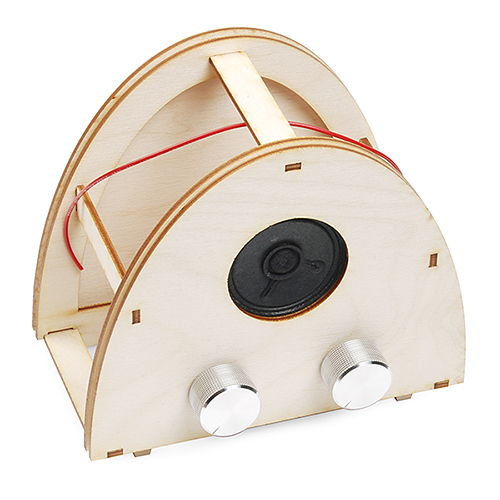 The FabFM is a simple kit which can be put together with minimal tools. All you need is a soldering iron and some flush cutters really. Once everything's together, you get a fully functioning FM radio, complete with volume control and digital tuning. You can even customize it with fabric or other materials to finish off the enclosure. For our international customers, we now have a couple of tool kits as well as some Learn to Solder kits with 230VAC soldering irons. We have the Beginner Tool Kit, Intermediate Tool Kit, and the Learn to Solder - Simon Says and the Learn to Solder - BigTime all in "EU" versions. All of the kits include the soldering iron with the plug shown above, and operate at 230VAC. Check out this new conductive ribbon. It's insulated so you can fold it, bend it, and not worry about shorting it out. It's not made for soldering, so you'll need to sew it in. But it's very flexible and a lot easier to work with than conductive thread alone. 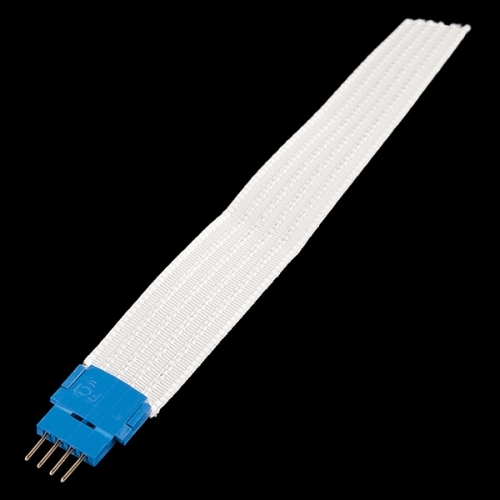 We even have a connector that snaps on easily for a breadboard connection. 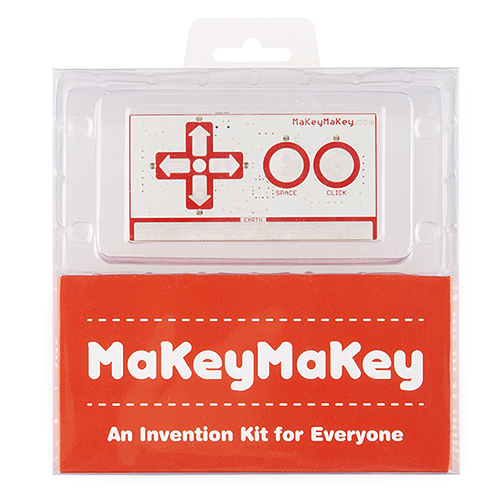 The original MaKey MaKey made quite a splash and now we have it in fancy retail packaging! You may see this in your favorite hobby store soon. The packaging also makes it great for gift-giving! 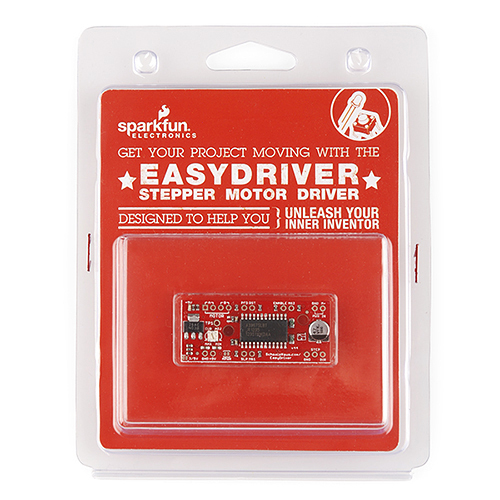 In addition to the retail packed stepper motor, we also have the Easy Driver in retail packaging, available soon at your local SparkFun outlet. We also have the PoEthernet Shield in retail packaging this week. We've even written up a nice quickstart guide to get you rolling. So if you already own the shield and need a little help, check out the tutorial. 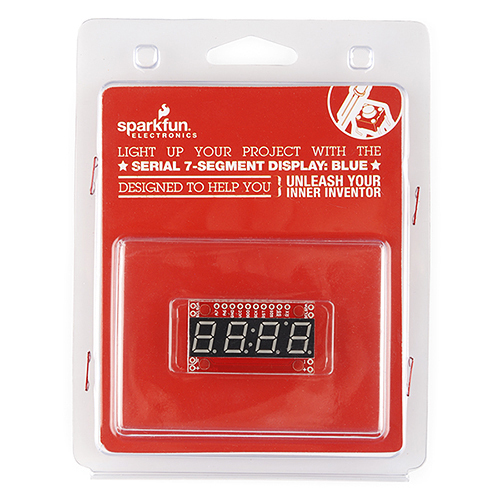 And lastly, we have two more retail products, the Serial 7-Segment Displays. We have them in both blue and red, and are packaged in gorgeous high-luster plastic. That's all folks! Thanks for reading and see you again next week with more products. My desk is filling up once again, so be sure to check out what we have next week. I normally delete these as a matter of policy. This one can stand as a warning to others. Maybe it should read: "Be the first to post a relevant comment." I think you have the speaker polarity switched. Rush Limbaugh sounded like he was 180-deg out of phase. I really appreciate that you've now added 230V tools! They came a few weeks late for our first soldering workshop but our Hackerspace will (hopefully) soon carry several of these. Robert- are you going to have a class on Speedy Gonzales soldering? Maybe you should just sit back down. For the better part of the review portion, you we're hunched over trying to reach the products anyway. Plus it's harder to see the actual products when you have to set the camera so far back to include both you and the table. Rob's standing is a result of me getting bored with the old look and wanting to try new things. In the future we will switch things up even more. Maybe a couch and coffee table, or better yet Rob can bounce on a trampoline! Next week I'll throw in a second close up angle for the products themselves. what Gregg said, I don't want to be standing either :-) I'd much rather be sitting on couch or in a chair. I absolutely hate heights, so the roof will never happen. and something about a video of me on a trampoline seems very creepy and odd. Really? Shake a stick at 7 products; 4 of which aren't "new"? I don't think you guys should post retail packaging as a "new product". They should just magically appear in the store with little fanfare. I really look forward to the new product posts and it's always a let down to see the same products in packaging for an extra dollar being passed off as new stuff. And seriously, how many people have actually walked into a store and bought one? SparkFun products in retail packaging are like Bigfoot. Has anyone ever seen one in a store? It's not like you sell them at RadioShack or Best Buy. I live in NY and it's at least an hour ride to the nearest mom and pop that sells SparkFun stuff. Sorry for being a little grumpy today, but it is what it is. Someone has a case of the... Fridays? I think he's phase shifted. That would be a case of the Mondays. A case of the Fridays would be him praising everything because... It's Friday! Who doesn't love Fridays? (I guess people who have to work Sat. and Sun - maybe he's one of those?). Never ceases to amaze me when people try to tell other people how to run their business, specifically when they themselves have probably never ran their own business. I drove down to Microcenter and bought Sparkfun packaged items. I have also been to JB Saunders and purchased Sparkfun material. Of course living in Colorado, sometimes it is nice to drive over to Boulder and pick the packages up directly in front of the huge clock! 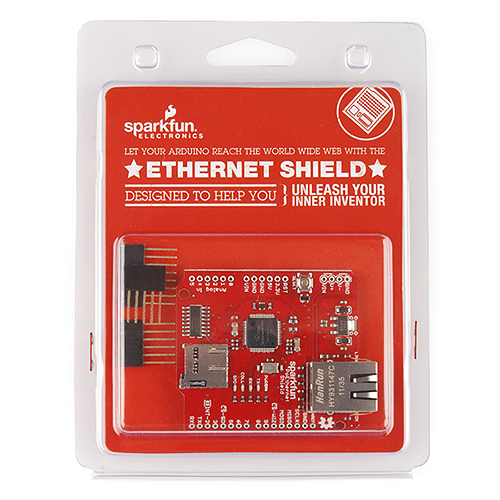 Well, here in Vancouver, Canada, on the fringes of Civilization, I can cheerfully walk into my nearby RP Electronics and pick up a number of SparkFun retail items off the pegboard. Sure beats all the border delays associated with mail-order. Pretty much the same prices, too, which is a welcome break from the obnoxious mark-ups that usually happen when stuff appears north of the border. Agreed. Near Toronto, Canada, I can think of at least three stores that sell SFE parts within a reasonable distance. We hear you, but for our distributors, it can be useful to include the retail items on our product posts! I do look forward to the new product posts, and while the "now in retail packaging" versions aren't directly relevant to me, they are new products, and some folks do need to know about 'em. And I do buy stuff in retail packaging, but from retailers, not directly from SparkFun (as yet - maybe one day I'll have my own storefront, who knows). One time I needed an XBee module in a hurry, and SparkFun were out of them at the time, so I picked one up at Microcenter and got on with my project. Just keep in mind, the stripe on an electrolytic capacitor indicates the (-) polarity terminal, and the stripe on a Tantalum capacitor indicates the (+) polarity terminal. I absolutely love the coffee mug sitting on the bench! There's no such thing as a "standard European plug" for mains I'm afraid. yeah, we get this. but when it comes down to it, it will work in most instances, and for the exceptions, you can easily use a plug adapter, and don't have to worry about voltage. While true, the used plug covers the vast majority of locales' specific socket configurations (the U.K. being a particularly notable exception). More importantly, though, these 230V-compatible devices can simply have their plug + wiring replaced by a plug that fits the configuration in the locale and 'just work', rather than having to acquire and deal with a voltage converter. Along with Ireland, Malta, Cyprus. Then there's the Danish and Swiss plugs plus some issues with plugs that fit a socket but don't make the earth connection. The point to be made is that USAnians often fall into the trap of regarding Europe as being one entity when it's far from the case. Sparkfun has done ââthe right choice adopting "Schuko" ("CEE 7/4") plug, because it's de facto standard across Europe. In European countries that don't use them officially it's very easy to find an adapter and there are many houses that have both "national" and "international" outlets on walls. It's also a matter of minutes to change a plug... So, Sparkfun's choice embrace most European users as possible, using only a single plug. The most important thing is that these devices finally accept 230V. Actually the plug shown is a CEE 7/7 one, which is a German/French hybrid. My point was made above - SF have made the mistake of regarding Europe as one entity with one standard mains plug. 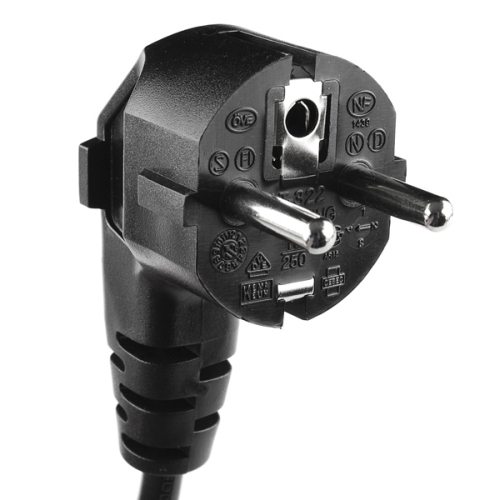 FWIW it looks like it may be illegal for SF to sell a product fitted with a non-BS1363 plug to a customer in the UK without an approved conversion plug. There's a legal obligation placed on a supplier outside of the UK to comply with the Plugs and Sockets etc. (Safety) Regulations 1994. Ah, ok, you are from UK. UK uses a different approach in many many things compared to the rest of Europe... The rest of Europe is quite more standarized. I don't know local law, but in most countries in Europe a local reseller can't sell goods using wrong plug, but is perfectly legal for a single customer to buy a device outside Europe with whatever plug. In this case (direct selling) seller does not commit crimes. Yes - I'm in leafy Guildford, Surrey. It's not only the UK that approaches many things differently. Back when I was involved with UL electrical approvals it always amused me that the US standards seemed mainly intended to protect property from fire, the UK & European ones were mainly to protect people from shock/electrocution. Just curious... why don't you believe in IC sockets for your kits? I know there's minimal cost involved, but something in my brain goes "nooooooo". But that's just my brain, and not indicative of other brains. btw, I enjoyed watching the assembly video. I bought my Wife a learn to solder simon says for xmas. I sure wish this radio was out. I would have bought her that. Another reason for not socketing- we usually alter the package we use for the DIP chips in our kits to remove one hole and to spread the holes further apart, so the assembler doesn't have to bend the pins in to get the chip to fit. Then we trim off one pin during kitting, so the chip can't go in backwards. While we could do the pin-trim trick with a socket, we can't also fix the width issue. I have heard several people say that in kits - especially those aimed at beginning hobbyists, IC sockets can be a real headache, and a source of failure. Apparently, a lot of beginners tend to feed too much heat and/or solder into the socket joints, and it ends up wicking into the contact area, blocking it from proper IC insertion. An exception to this would be machined-pin sockets which are closed on the bottom, but the higher cost of those makes them unlikely to be used in kits. It's true, sockets bring their own host of issues. But sometimes they're nice. The two cases I've seen are ICs inserted backwards (really hard to undo without a socket) and an unprogrammed IC (in that case, they just soldered on an ISP header and borrowed a programmer from work). Hmm I don't think I've ever run into that. But I could see the possibility. I have seen it's more likely to have a solder bridge on the top side of the board due to the socket. glad that was well received. On the SFE facebook page I saw a horse head in the studio, but not in the video? WTF? "We also have the PoEthernet Shield in retali packaging this week. Weâve even written up a nice quickstart guide to get you rolling. So if you alredy own..."
Human spellchecking - it's a gift, and a curse. dang, our new editor does away with spell check. I got so used to squiggly lines. Now it just looks like everything is spelled right.